Widespread poverty usually causes social tension, crime and sometimes violence. There is no scarcity of evidence about the extent or severity of poverty in pre-famine Clare. Outbreaks of distress, lawlessness and violence at that time indicate particularly severe periods in what turned out to be a long era of misery. Some of the causes of this hardship are easy to see while some are quite complex. For example, too many people were over-dependent on the potato as a staple food. When it failed, famine quickly followed. Cause and effect are obvious in this case. What is not so clear is how so many people came to be permanently in such dire need and why society seemed incapable of helping them. 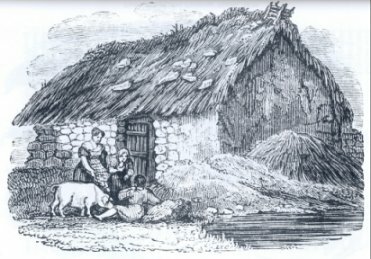 This essay looks at some of the evidence connected with poverty and violence in pre-famine Clare and attempts to discuss underlying causes. The population of Clare doubled in the fifty years before the famine. It stood at 286,394 in 1841, almost four times the current total. These were divided into 48,981 families, and apart from a small number of professional people and craftsmen, all of them earned a livelihood from the land. The great challenge of that time was the provision of food and work for such a teeming population. As in contemporary society, people at that time may be divided into employers and employees. Most of the big employers before the famine were the landlords. They employed a permanent male and female staff for indoor and outdoor work on their estates. For example, there was a permanent staff of 34 at Butlers of Castlecrine in this period, but many additional people were needed during busy times of the year. One of Clares problems was a scarcity of these very magnates who were able to generate so much wealth. William Smith O'Brien, an M.P. for Ennis for a time, drew up a list of Clare landlords. He counted 90 resident gentlemen and 63 non-residents. Of particular significance was his discovery that the non-residents owned about half the land of the county. Most of these absentees employed agents to collect their rents, but the money was generally spent elsewhere. This was a big loss to Clare. The resident gentlemen were more than just landlords. They actually carried on the work of local government and industrial development. They were people of capital who spent most of their wealth locally. They built roads and bridges, and even towns and villages. Sixmilebridge, Newmarket-on-Fergus and Kilrush are examples of places developed by the initiative of local resident landlords in the eighteenth and early nineteenth centuries. Clare had scarcely half the resident landlords it could have had and that meant less development and less permanent employment. The 1841 Census further revealed that the county had only 1052 farms of more than 30 acres. The large tillage farms had considerable employment potential, especially at sowing and harvest time. However, many large holdings belonged to graziers who needed only a few herdsmen. 80% of all farms were between one and fifteen acres in size, and even with the most intense cultivation could hardly be expected to employ more than a family or two throughout the year. The real hardship cases were among the 22,000 families that had no land of their own. It is hardly an exaggeration to say that half the people of Clare, the landless labourers, subsisted under a spectre of poverty that was a direct result of a gross shortage of work. This situation arose from developments in the Irish economy outside their control. The two decades before 1815 were years of extraordinary growth and boom for Irish agriculture. Britain and France were at war, and there was a constant demand for Irish food, especially beef and grain. Farm incomes were steady and buoyant, even on small holdings. Landlords let more land and got higher rents. Farms were sub-divided and sub-let and even marginal land was cultivated to produce grain and potatoes. There was plenty of work and the labourer and his family were a significant part of the tillage economy, especially along the western seaboard. Some understanding of the role of the labourer can be got by examining the tillage pattern that was adopted in most small and medium sized farms. Firstly, the ground was manured for potatoes. Farmyard manure, seaweed, and sand were some of the fertilisers used, but they were both scarce and expensive. Frequently, a more primitive method of top dressing the ground was resorted to before cultivation. All the growing vegetation was burnt off and the resultant ashes were dug into the soil. This procedure gave some short term results, but was no substitute for proper organic manuring. On the contrary, if the same piece of ground was burned on a number of occasions the fertility of the top soil was destroyed. Indeed, there are still signs of the ruinous effects of pre-famine burnings in fields near Miltown Malbay. Potatoes were generally the first crop to be sown on new ground. Wheat was planted the following year and then as many crops of oats as could be grown until that piece of ground was exhausted. The ground was then allowed to lay fallow for a year before the whole process started again. The labourer was very much involved in the whole process because of the amount of spadework involved, and the way the system worked. He traded his labour for a potato garden to feed his family. He usually got a fresh plot of ground annually from his employer and was expected to manure it before sowing the potatoes. Once the labourer had taken the crop of potatoes from a plot it reverted to the farmer who then grew several crops of corn for himself. It can be seen from this that the labourer played a key role in both the cultivation and provision of manure for tilled land. It was a labour intensive business in an era before the use of machinery became widespread. This was the reason labourers were allowed to build cabins on farms. Those labourers not attached to a farm built cabins on waste ground, or on a bog, and rented conacre for their gardens. They usually called the rented land mock ground. The success of this tillage system really depended on a strong demand for the products of the soil. Such a strong demand with good prices continued during the Napoleonic Wars. Conditions changed completely in 1815 when the war ended. There was an immediate drop in demand for Irish food, a drastic cut in prices, and the beginning of a long and almost permanent depression in tillage farming. This depression had serious consequences for small farmers who found it increasingly difficult to pay high rents that had been fixed during the prosperous years. Many of them were already operating at subsistence level and found it increasingly difficult to pay labourers for their work. Bigger farmers and landlords were tempted towards raising cattle rather then crops because of lower costs and less damage to the land. These developments spelled disaster for the labouring class whose numbers kept on increasing at an alarming rate. Soon, the term labourer came to stand for those who were unemployed rather than those who had work. The instinct of the labourer became focused on survival rather than comfort. The guarantee of survival was a garden of potatoes every year to feed the family. The potato was not a very reliable plant and its partial failures led to hunger and distress several times after 1815. There were severe famine conditions, mostly for labourers, in 1817, 1820, 1822, and 1830. The summer months were generally the worst time of the year for poor people. By then, the old crop of potatoes might be exhausted and the new one not yet fit to dig. The period round July was often called the July or the bitter six weeks. In a really bad year, such as 1822, distress began in the winter, and early spring. By the summer of that year, three out of every four people in the county were in need of aid. The arrival of factory-made cotton clothes also had serious consequences for labourers. Clare had a vibrant cottage industry in the first quarter of the nineteenth century. Coarse woollen cloth usually called frieze, as well as stockings and gloves were widely produced and sold to visiting dealers at markets in Corofin, Ennis, Kilfenora and Ennistymon. The demand for these goods disappeared very rapidly and left many families without cash incomes. The market villages themselves fell more and more into decay and were crowded with impoverished trades people and labourers. The periods of distress greatly embittered labourers towards their more comfortable neighbours. They were particularly resentful of farmers and landholders who opted to keep cattle in preference to tilled fields on which they could find work. The agrarian crimes of the period show how the labouring class tried to ensure their own survival at the expense of the more substantial farmers. This conflict reached its most intense climax in Clare during the spring of 1831. There was severe distress during the spring and summer of 1830. Potatoes quadrupled in price despite the best efforts of relief committees. Hard pressed labourers borrowed heavily from farmers in order to survive. The farmers had no confidence in the ability of the insolvent labourers to re-pay their debts. This led to a crisis in the early months of 1831 when negotiations began about the rental of the new seasons conacre. The farmers demanded greatly inflated prices for the poor mans potato garden. In fact, the rate demanded for conacre was often four times the rent the farmer had to paid his landlord for the same piece of ground. The labourers interpreted the increased rates as a threat to their very survival and reacted accordingly. They began to form themselves into secret societies, or what the government more accurately described as combinations. The word society gives the impression of a high level of organisation, but this was not the case. Groups of labourers gathered spontaneously and bound themselves together by oath to fight for their rights. These rights included conacre at an affordable price and a minimum wage of a shilling per day. The combinations in Clare were called The Terry Alts. The following story provides a plausible explanation for such an unusual name. A retired veteran by the name of Terry Alt lived near the village of Corofin. He was a most inoffensive person who was in the habit of attending service at the village church. One Sunday morning, another man on his way to service was attacked and severely beaten by a party who waylaid him. The victim described one of his attackers as having worn a straw hat. At that very minute, Terry himself came on the scene and was attired in a straw hat. The locals began to cajole him about being one of the attackers. Soon, it became a cant and every violent attack was attributed to Terry Alt. The combinations virtually took control of the county in the first half of 1831. They achieved mastery by their own power of numbers and by the weakness of the forces of law and order. The latter very much depended on the gentry who as magistrates were expected to defend their own neighbourhoods. The gentry were scarce in Clare and at the first sign of trouble most of them headed for the safety of Ennis and called on the government to introduce the insurrection act. Apart from their connection with the law, the Terries were mainly interested in the gentry as owners of guns. Guns were scarce in those days and poor people could neither afford nor get licenses for them. They were the preserve of the gentry and strong farmer. The Terries needed weapons to make their own system of terror more effective and frequently attacked houses to get them. Thatched houses were especially vulnerable, but even Sir Edward O'Brien felt insecure enough to keep 25 armed men on the alert at Dromoland. Farmers stayed on guard at night, or even left their homes out of fear of the Terries. Night after night, parties of men broke down the doors of farmers houses and brutalised the inmates. They were usually beaten, put on their knees and made to swear that they would give out ground, or take the consequences. Those who remained stubborn were visited again and sometimes had their fields dug by parties of men with spades. In some cases, hundreds of men turned out to dig fields. Threatening notices were posted at cross roads, or near chapels and the Terries took no notice of the condemnations of either clergy, or politicians. Special attention was given to grazing farmers. The walls of their fields were levelled and the cattle driven on to the roads where they lost weight, or were stolen. Fifteen people were murdered by the insurgents, mostly agents and stock masters. The Terries were very successful in achieving their main aim. Farmers and landlords all over the county were forced to give out ground at reasonable rates. Eventually, the government sent in large numbers of troops and special police to patrol the roads and confront the Terries. A Special Commission was established to try those arrested for committing outrages. Executions and transportations soon loosened the grip of the combinations and restored the rule of law, but not before mid-summer when plentiful crops of potatoes were already flourishing on the contested mock ground. The Terries had achieved their main objective before they were defeated. Many were to suffer for their involvement in the combinations, but landlords and farmers also learned a terrible lesson. One of the landlords who was terrorised from his estate in 1831 was John Vandeleur of Ralahine. He had more reason for leaving than most of the others. His trusted agent, a Scot named Hastings, was brutally murdered by the Terries. He had a reputation for being hard on the labourers. Vandeleur decided to hand over his demesne with its troublesome workforce to an Owenite experiment. In the middle of the Terry Alt disturbances, E. T. Craig arrived from England to establish a workers co-operative on the estate. He formed the labourers into a commune which rented the demesne from Vandeleur and farmed it in their mutual benefit. This experiment progressed satisfactorily for two years until Vandeleur became bankrupt. His creditors foreclosed on the estate and wound up the co-operative. The Ralahine Co-operative was really the only imaginative attempt find a solution to the problems of labourers in the pre-famine period. Its term of existence was too short for it to make any lasting impact on the economic and social system of the surrounding area. The disastrous shortcomings of the system were finally exposed by the Great Famine which began in 1845. In a few short years, the labouring class in Clare was exterminated by hunger and pestilence. Comber, Maureen (ed.) Poverty before the Famine: County Clare 1835. First Report from His Majesty's Commissioners for Inquiring into the condition of the Poorer Classes in Ireland. CLASP Press, 1996. Craig, E.T. An Irish commune: the experiment at Ralahine, County Clare 1831-1833. Irish Academic Press, 1983. Enright, Flan 'Murder at Clondegad, 1831' in The Other Clare, vol 9. Enright, Flan 'The pre-famine worker in the Shannon-Newmarket area' in The Other Clare, vol. 5. Eiriksson, Andres Crime and popular protest in County Clare, 1815-1852. Unpublished Ph.D. Thesis, Trinity College, Dublin, 1991. McMahon, Michael 'Agrarian conflict in Clare, 1818-1831' in The Other Clare, vol. 18.